Members of the ‘public and patient involvement’ (PPI) group associated with plans to change local health services are being asked to sign a confidentiality agreement before they can see secret papers setting out planned changes to health services. How Simon Stevens imposed a reorganisation designed for transnational capitalism on England’s NHS. Fab photo by the great freelance journalist, Beth Walsh @WalshyPictures. 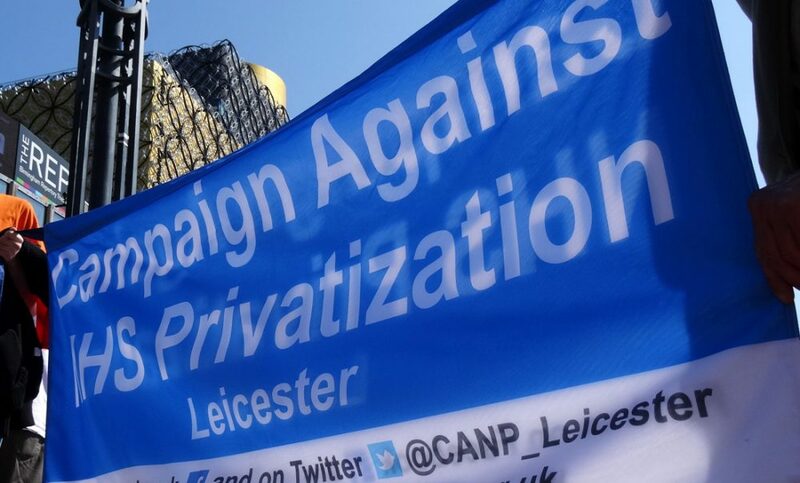 Three coaches from Leicester and one from Loughborough, carrying CANP members among others, travelled to London for the national march for the NHS. Speakers included Dr Louise Irvine, John Lister and Jeremy Corbyn. The marchers demanded an end to underfunding and the restoration of strong, high quality services. 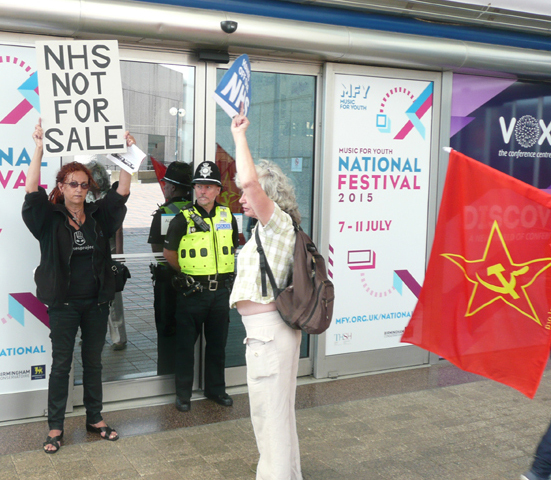 Outside the International Conference Centre there was a demonstration of about 50 people from various groups, among them CANP, the Green Party, Keep our NHS Public and 38 Degrees. Members of 38 degrees were prominent in the orange tee-shirts. Do you support the closure of over 500 beds in the NHS in Leicester, Leicestershire and Rutland, as planned in the Better Care Together Five Year Plan? 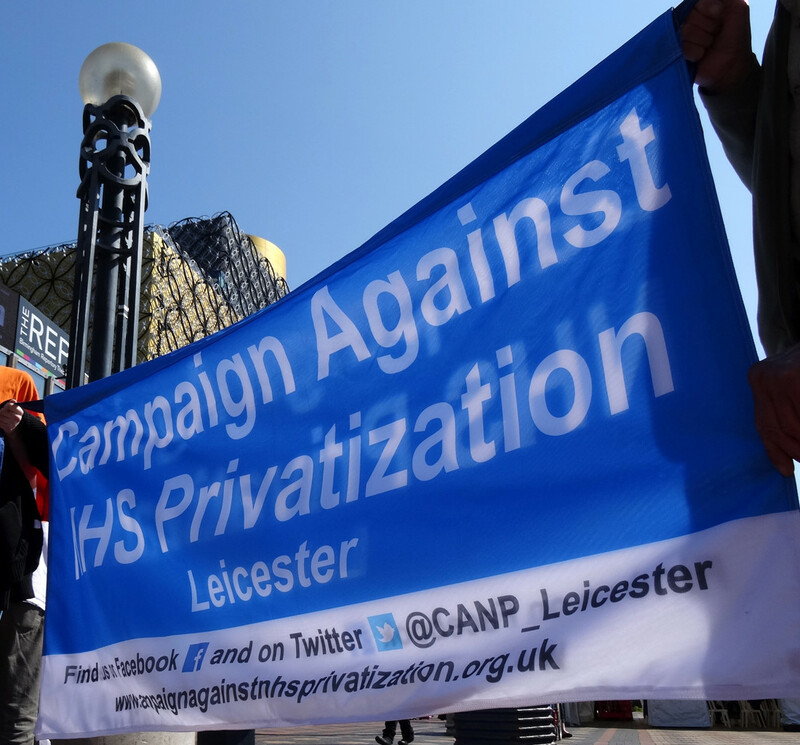 What role, if any, does privatisation have in the NHS? What role, if any, has market competition in the NHS? How much real terms additional funding would you give to the NHS each year? What is your position on the Transatlantic Trade and Investment Partnership Treaty, particularly in relation to the NHS? Do you think the founding principles of the NHS are still relevant today? 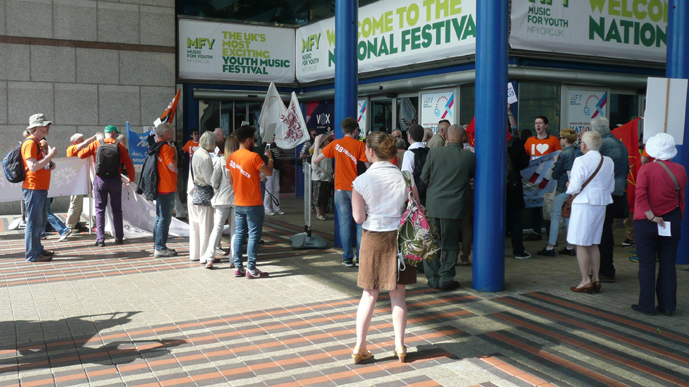 Tens of coaches full of people from across the English regions, including three from Leicester, travelled to Manchester on 29 September for a march in protest and support of the NHS at the Tory Party Conference at Manchester. 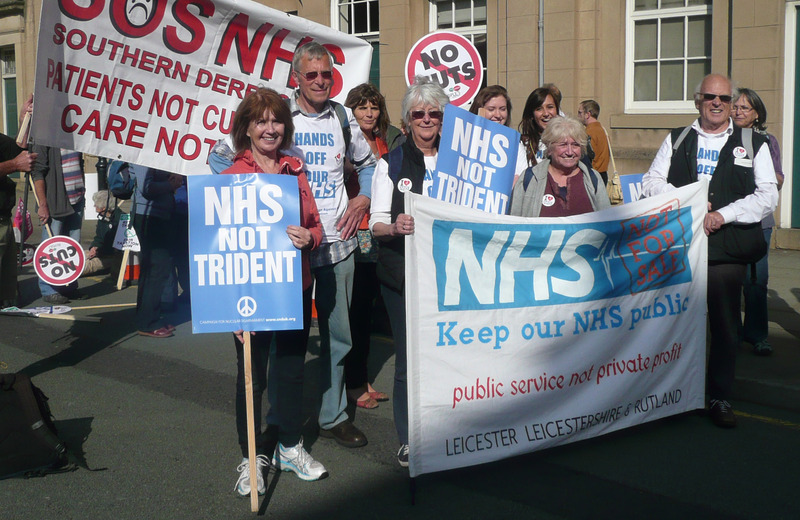 Huge crowds marched in good spirits, loud, colourful and very determined but peaceful – to fight to save the NHS. The NHS is one of Britain’s finest achievement’s. But the government’s disastrous changes in the NHS, coupled with budget cuts of nearly £28bn has led to nearly 2.9 million people on hospital waiting lists. Police estimated around 50,000 people involved in the march, thought to be the biggest in Manchester. But march organisers put the number of protesters to be higher – between 80-100,000. 0 0 Several members of the campaign attended the national conference for activists organised by Keep Our NHS Public and the NHS Support Federation in London in June. Here are the notes from that conference of two delegates. Using evidence to make your case – brief notes Workshop run by Lucy Reynolds – London school of Health and Tropical Medicine. Make sure you have a clear and useful message. Decide who you want to receive the message. Work out your desired result. Design a follow up – ie attend a demo/meeting/write a letter etc. Use trusted sources of evidence to back up your case. Make sure your argument is simple – maybe use a flowchart or a mind map. You need supporting evidence for and factual information. The evidence needs to be credible – give references. Some websites are credible, others not –use with care. If writing to a minister or an MP – use their own words either from a newspaper, a letter or a statement on the media and then say why you are questioning them. Hansard is a reliable source of data. The following points were raised for our information by members of the Stroud Against the Cuts group. Their experience stems from fighting to prevent the transfer of Stroud Hospital and eight other NHS services to a social enterprise company. Their protest went as far as a legal challenge. Massive secrecy can conceal ‘done deals’. No consultation is required for a change in provider if there is no change to a service. This affects objections on grounds of lack of consultation. There is a possible sleight of hand when outsourcing to social enterprise or community interest companies (CICs). These supposedly benign providers – social enterprise companies may have internal and external shareholders – may provide cover for commercial companies to take over at the end of a contract. It is important to know that that the NHS can/needs to consider allocating services within the NHS, to other or new Trusts, before external tendering, i.e. there is no obligation to outsource commercially. 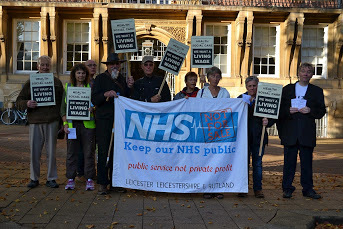 The Stroud protest group discovered that there is a legal case to answer under EU law if outsourcing a service from NHS can be shown to damage patient care. They therefore framed their legal challenge around a specific patient case using a volunteer who was prepared to appear in court. In the event the government decided not to contest the case as a legal decision in Stroud’s favour would have widespread consequences. The result was a court order to NHS requiring them to advertise for expressions of interest and to consult with patients and staff. One possibility was to make a new, or merge with another Trust. They await developments. There are significant issues to be thought through before making a legal challenge. Costs may be in excess of £100.000. Using a single patient as the basis of their case lessened Stroud’s problems because the patient was eligible for legal aid. In addition they raised £7000 from donors to pay a solicitor. As things turned out they could repay but, had they lost, they would have been in difficulty with donors who were only lending the money. Jon Ashworth MP has called a public meeting to discuss the threat posed by the government’s plans for the NHS. It is essential that the public understand why these plans threaten the future of the NHS. Please let others know about the meeting and persuade them to attend. unless we aII fight for it. We have become accustomed to free access to health care but Parliament is about to pass a Bill abolishing our National Health Service. There will no longer be a national health service and no one will have legal or overall responsibility for meeting all our health care needs. The care you are entitled to may depend on how much you are able to pay. Companies and corporations will deliver our health care. The Bill if passed will allow private companies to decide what care you are entitled to and whether you need to pay for it. Their priority is to make money for their shareholders, so the focus will be on profits, not patients. Doctors will not have the final say in your care. Profit-making private healthcare companies, not doctors, will decide what care you can receive, where you receive it or whether you receive it at all. Wales and Scotland will continue to provide all medical care free of charge and on the basis of need. 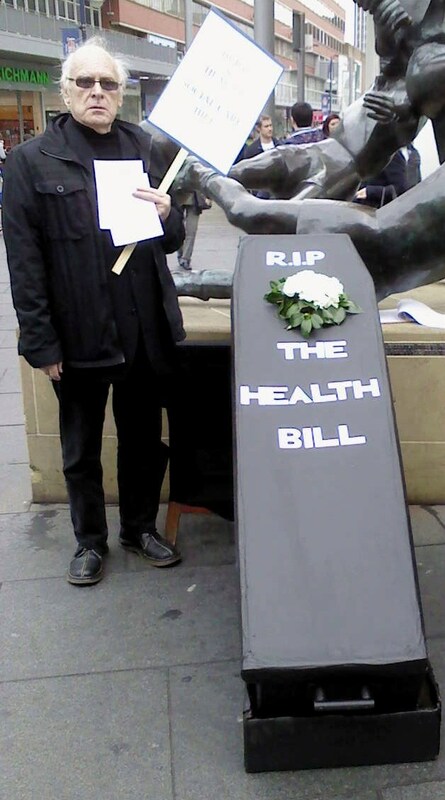 lf the Bill is passed, access to health care in England will be the worst in the UK. This is because the Bill repeals a legal right to the same services as those provided by the NHS in Scotland and Wales. The Royal College of Nurses, the Royal College of Midwives, the Royal College of GPs, the Royal College of Radiologists, the Chartered Society of Physiotherapy, the British Medical Association, the Royal College of Psychiatrists, the Chartered Society of Physiotherapy and the Faculty of Public Health are all opposed to the bill.
! even more welcome if you wear black ! 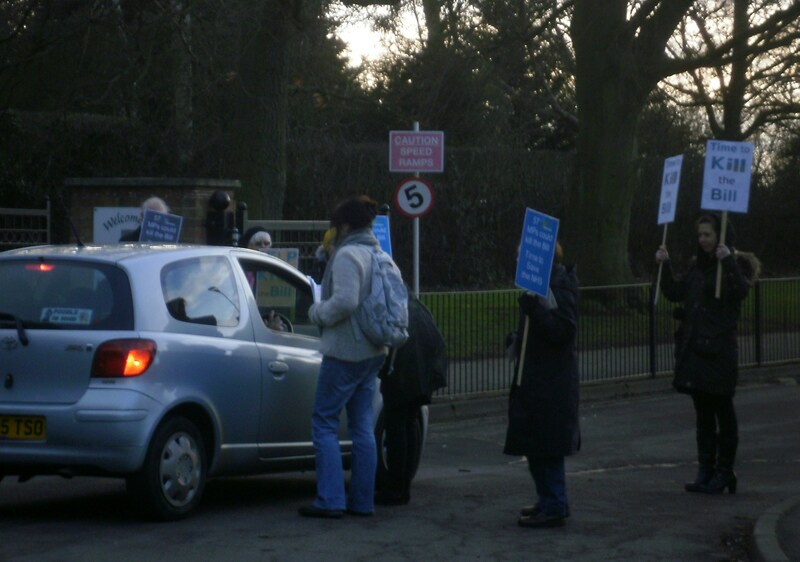 STOP THE LANSLEY / CLEGG ROADSHOW! Why is Nick Clegg propping Lansley up? Clinical Commissioning Groups have no duty to secure comprehensive health care; instead they have discretion to define NHS entitlement. Everything outside that will be potentially chargeable. NHS foundation trusts will be able to earn half their income from private medicine. Result: health care free at the point of delivery is finished as an underpinning principle; health care on the basis of need alone is finished. Thanks. The bill brings to an end 63 years of the NHS as a public service. It turns it into a regulated market much like the utilities market. Yet there is no public mandate for this bill. Is this another example of the ‘new politics’? It is a charter for big business. Smaller businesses and third sector organisations will be squeezed out of this market over time. ‘Level playing field’ is a theoretical construct. It does not exist outside a text book. Why does Nick Clegg think it does? The Royal College of Nurses, Royal College of Midwives, Royal College of GPs, Royal College of Radiologists, Royal College of Psychiatrists, BMA, Chartered Society of Physiotherapists and Faculty of Public Health are just some of those professional organisations which oppose the bill. Should this not be ringing alarm bells??? January 10-15th, 2012. 160 miles in 6 days from Aneurin Bevan’s Statue in Cardiff to the Department of Health, Richmond House, Whitehall, London. To protest against the Health and Social Care Bill and NHS privatisation. Calling at Witney (David Cameron’s constituency). Follow me on Twitter @cpeedell and #bevansrun. 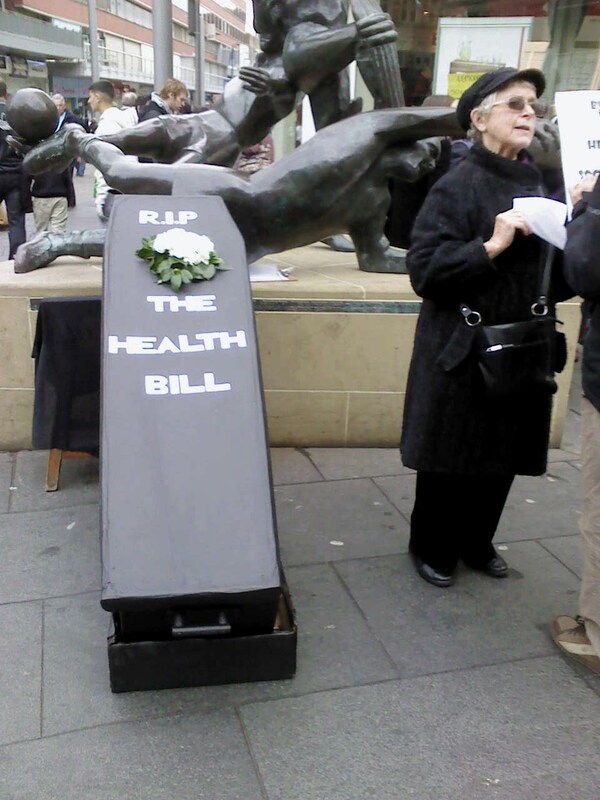 The Health and Social Care Bill? In common with many professional organisations, such as The BMA and The Royal College of General Practitioners and campaigning groups such as 38 Degrees, local Labour Party members, do not feel the Coalition’s summer “Pause” has properly addressed the main objections to the Bill. Despite some amendments to the Bill, there are still huge concerns that opening up the delivery of services to “any willing provider”, and the loss of the duty of the Secretary of State to provide or secure provision of medical services and be accountable for a universal National Health Service, will lead to the privatisation of the NHS. There is a real fear that private companies and organisations will make easy profits from the cherry picking the services they want provide and leave the more complex and costly ones to the NHS. It is felt that although the Coalition Government has been very ready to criticize the current level of bureaucracy and said it wants to reduce it, some of the proposed changes, particularly around the role of the new national NHS Commissioning Board, will actually increase the tiers of bureaucracy and the complexity of the NHS.